So, insert Newman’s Own Organics Espresso Chocolate Chip Champion Cookies. I wasn’t sure if I was going to like these, actually. I’m not a *huge* fan of coffee or espresso, in fact, I really never drink it, either. I just never have really been a coffee or espresso person, so I was hoping for the best. I opened up the bag and saw cute sized cookies- bigger than the typical “mini” cookie, but not quite as big as a standard sized cookie. Just the right mini size in my opinion. They smell was like an average chocoalte chip cookie, wit just a hint of espresso/coffee aroma. It was a crumbly, sweet cookie, with a brown sugar/vanilla taste. There were quite BIG chocolate chips in proportion to the cookie. Actually, chips? I think that they were more like chocolate CHUNKS! And soooo good, too! A milk chocolatey flavor, sweet, and buttery. Delish. . The overall cookie did have a coffee-espresso flavor, but it wasn’t overpowering at all. I liked that a lot! I think these would be great for a espresso lover, or for someone who is not too fond of espresso- as it’s a good balance of both. So, the verdict? 4 1/2 tasty stars. These were so good. It was like, I took a cookie out, began to eat it and thought, “ooh, these are good”, then took another, and thought “no no, these are REALLY good!” The only thing holding it back from a 5 star rating is the nutrition. Indeed, they are cookies and I will use them as a treat, but they are a bit high in saturated fat for my preferences (3 grams per serving). Otherwise, I think a perfect compliment to a cup of coffee (if you like coffee), or a ice cold glass of milk ! 1 serving is 4 cookies (33 grams) 150 calories, 7 grams of fat, 21 grams of carbohydrates, 1 gram of fiber, 11 grams of sugar and 2 grams of protein. I eat pretty healthfully, with balanced meals with protein, carbs, fiber and healthy fats. But after lunch (usually my post-workout meal), i like to have a little “reward” or something sweet to seal the deal and tide me over until snack time later. 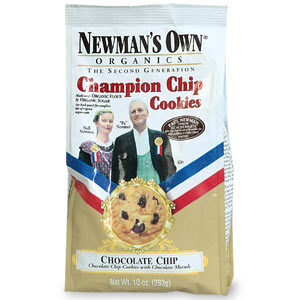 So with my grilled cheese sandwich and apple, i decided to give Newman’s Own Champion Chip cookies a try. I tried the chocolate chip flavor, but they also come in Espresso Chocolate Chip, Orange Chocolate Chip, Double CHocolate Mint Chip, Chocolate Chocolate Chip, and Wheat Free/Dairy Free Chocolate Chip. I hope to try the chocolate chocolate chip ones-those sound good! I opened the bag and saw a whole bunch of bite-sized cookies. They smelled delicious-fresh and like a bakery. They have giant sized chocolate chips on them that literally melt in your mouth when you take a bite. The cookie part is crisp but also soft, and buttery tasting. It’s crumby and falls apart in your mouth. I could already tell- these cookies were going to be addicting! 🙂 They taste just like something you would get at your local bakery-but made a lot healthier with wholesome ingredients! 4 cookies is a serving size, and that is 160 calories, 7 grams of fat, 21 carbs, 1 gram of fiber and 2 grams of protein. Organic Unbleached Flour, Organic Sugar, Organic Palm Oil, Organic Chocolate Chips (Organic Sugar, Organic Chocolate Liquor, Organic Cocoa Butter, Organic Corn Syrup Solids, Soy Lecithin (an emulsifier), Organic Vanilla Beans), Chocolate Chips (Sugar, Unsweetened Chocolate, Cocoa Butter, Dextrose, Soy Lecithin (an emulsifier), Vanilla), Liquid Egg Whites, Oats, Vanilla, Baking Soda, Salt.